Let Arizona Overland Blueprint (est. 1987) a leading Document Scanning Service Bureau, scan your paper. And provide you with unbeatable service. • High volume small format paper scanning, Architectural & Engineering plans, maps, pictures, artwork, we scan it all. We can scan virtually any size document in black & white or Color! For an on-line black & white estimate, please go to our Scanning-Quote page. For Color &/or an actual quote please contact us at (602) 224-9971. Herein provides more information about scanning and how we do it. By transferring documentation to electronic format your data and information becomes more accessible, user-friendly and can save your business time, space and money. As specialists in digital document archiving in the U.S. for the last 25 years, we can convert all your data onto a medium which requires less space and will improve office efficiency. We are HIPA compliant and will care for your documents with the highest quality, care, and sensitivity. Relying on single source data can make disaster recovery very difficult. 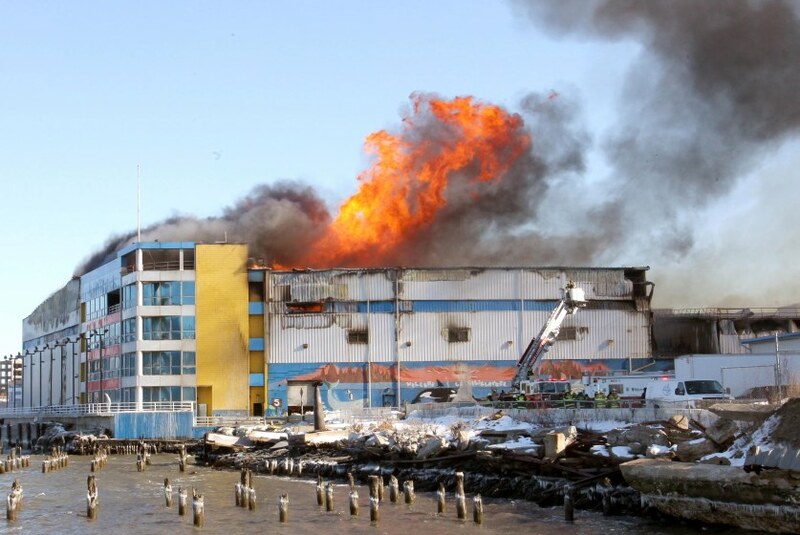 Photo of a fire scene at 5 North 11th Street in Brooklyn (Photo Credit: New York Post/G.N. Miller). Electronic document management may be the answer, but careful consideration needs to be made for how the information will be accessed. The primary misconceived disadvantage to electronic document storage is that scanning and indexing exceeds the cost of paper storage, FALSE. When compared to the storage costs for paper and the time saving achievable for document retrieval, SCANNING SAVES MONEY. Another misconception is that the process is quite involved, time consuming and arduous. 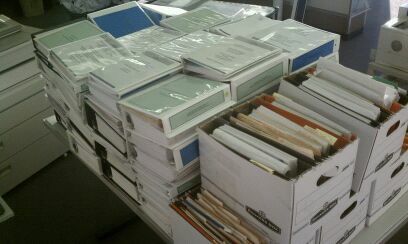 We make it simple, by outsourcing to Scan In Paper and AZ Overland Blueprint; we do the work, and make it easy for you. Still another misconception is that you loose access to the paper when it goes off site. We provide 100% access, and we even find the files for you. Security may be a great consideration and care should be taken to ensure that the system chosen can only be accessed by authorized personnel. Most systems involve taking the hard copy originals and scanning them to produce electronic images of the pages. The most common format for these images is Portable Document Format Files (PDF). These may be single or multi-page images. If you have the time, this scanning can be done using a standard flat-bed scanner but commercially it is done using high-speed scanners. These are similar to a photocopier with an automatic document feeder and can scan hundreds of pages per minute. The disadvantage of these machines is their cost and the time and cost associated with learning and operating this equipment. A typical high-speed scanner can cost (in excess of tens of) thousands of dollars and so it is not the sort of machine that most companies want to purchase unless there is a significant scanning requirement. Keep in mind though that in addition to the capital required for the equipment, there is also on-going labor cost associated with operating this equipment which is far greater than the cost of the equipment. Once the documents have been scanned, they need to be indexed in some way so that they can be easily found. This is similar to filing documents in alphabetical order. Each image is viewed and information such as invoice number or supplier name is read and entered into a database. This can either be carried out manually or automatically by using barcodes or Optical Character Recognition (OCR). OCR is the process by which each character is examined by the computer and converted into a computer readable character code. Once a database has been created, documents can be easily found and sorted by any of the keywords in the database. For example, invoices might be indexed by invoice number, date and customer name. Here is another advantage of electronic storage: documents are now filed in several different ways and are therefore more easily found than in their original form. An alternative to creating a database is simply to re-name the images by the title of the document. An example might be for sales invoices where each image is given a filename corresponding to the invoice number. Obviously this only provides one means of finding a particular document. After indexing and scanning, the images and their associated database, if there is one, are written to CD, DVD or similar medium to be returned to the customer. Typically a CD will hold 16,000 images. That’s the equivalent of two, four-drawer filing cabinets. There are a host of different image viewing software packages and database formats available on the market. The PDF format is the most common platform in which documents are typically scanned today. Tagged Image Format Files (TIFF) images can easily open-up automatically on any computer running a Microsoft operating system. Therefore TIFF images rarely require any additional software. Many people are aware of the Adobe PDF format for electronic documents. Essentially a PDF is a widely used format that can be read by anybody whom has the free software; Adobe Acrobat Reader. This small piece of software is available free of charge from Adobe and PDF files are frequently used for distributing documents on the internet. Nevertheless, both are widely accepted formats. Typically a PDF is slightly larger in size than the equivalent TIFF file. Systems are available for the indexing of TIFF or PDF files and OCR can be used to create “Image and Hidden Text” format PDF files. In these, the text of a document is not only viewable but it can be edited as well. Text can even be copied and pasted into other formats such as Microsoft Word. Obviously this format should not be used for those documents that must remain exact copies of the paper originals. A PDF file is ideal for those who want to publish information on the web. If you would like more information on how document scanning could help your business please contact us or feel free to request an on-line quote. Outsourcing your document scanning is a cost-effective solution. But if you want to try it for yourself, we are the Authorized Dealers for the finest scanners in the industry. The cost to do it yourself (scan in-house) is predicated by the amount of time it takes to produce the work. The time and expense of the labor is often grossly underestimated. Consider that there is often a learning curve for first time projects, preparing the documents to be scanned is usually more time consuming than the actual scanning of the documents, and maintaining a high level of attention while performing monotonous work (which is common for this type of work) is both critical and difficult to achieve. To perform in-house scanning you must also acquire the scanners with dedicated computers. Our effective solutions let you put our experience to work for you; whether through the guidance and support that we provide when you rent or purchase a scanner from us, or by outsourcing part or all of your scan project to our team of professionals. The most important factors when choosing a scanning company and a system are based on your needs and the Scanning Service Bureau’s ability to fulfill those needs. If there is doubt, we want to help. Scanning is not a complicated job; however, knowledge, experience, and the ability to easily accommodate in order to fulfill the clients’ expectations are paramount. It’s important that everyone is provided the best value for the dollar. What about On-site Scanning Services? We can provide blueprint scanning services at your facility so documents will never leave your site. We have personnel and equipment ready to handle on-site projects of all sizes. However, utilizing Scan In Paper and AZ Overland Blueprint’s Scanning Service off-site is a more economical outsourcing solution by providing most of the benefits of scanning in-house without taking up any space at a considerable savings and with little to no disruption to your every-day business. We deliver additional value in prompt service, experience, expertise, higher quality, and lower cost. Scan In Paper and AZ Overland Blueprint; what we do. Scan In Paper and AZ Overland Blueprint are a Scanning Company that knows how to scan cleanly, fast, and at an affordable price! Scan In Paper and AZ Overland Blueprint provide great value by inexpensively scanning documents on high-volume document scanners. We provide paper scanning; taking most any size paper and converting it to computer files. We also specialize in large format scanning, blueprint scanning, and drawing scanning. We also offer high volume scanning, OCR scanning and document conversion services including PDF conversion. Outsource your document scanning, drawing scanning, and data conversion needs. Scan In Paper and AZ Overland Blueprint will provide a solution for all your document management requirements. Our efficient crew scanned this project of over 55,000 sheets in just 3 days! Would you like a quote for your scan project? If you’re looking to engage our high-volume scanning services or have inquiries then please contact us. We are specialists in high volume backlog scanning and large format drawing scanning. We provide the document imaging needs of many by providing scanning services for any size document, up to 42” wide in color, grayscale or black and white. Our service is proven and trusted. Regardless of your industry and its own unique rules, regulations and restrictions, we can deliver a safe, secure, legal and custom tailored outsourced scanning solution. We believe that the rates of our high-volume scanning service are some of the lowest you will find anywhere in the US! Scan In Paper and AZ Overland Blueprint are the ideal partner for outsourcing your document conversion project. Scan In Paper and AZ Overland Blueprint’s document scanning staff have years of experience. We have been involved in numerous small and large format scanning projects for The U.S. Forest Service, The City of Phoenix, Arizona Department of Transportation, and other Municipalities. In addition to projects for Engineering and Industrial Contractors, Fabricators and Manufacturing Companies, Medical Billing Companies, Doctors, Hospitals, ,and other Companies in the public sector. We scan large format Architectural plans, Engineering blueprints Mechanical drawings, large charts and maps, as well as document scanning of Medical records, Payment records, Employee records, Trial support and many other paper to electronic scanning. Can Scan In Paper and AZ Overland Blueprint provide High-Volume Scanning Services throughout the U.S.? Scan In Paper and AZ Overland Blueprint excel in providing clients with personalized solutions. 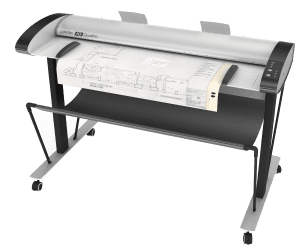 Scan In Paper and AZ Overland Blueprint are a one-stop shop for your entire small to large format scanning. We can scan anything from small pieces of paper to plan sheets 42″ wide by virtually any length, and thick mounted images too. By using Scan In Paper and AZ Overland Blueprint, all of your project will be carefully managed by our experienced team of digital technicians. Since we also sell scanning equipment, we use the latest digital technology to scan your documents. Scan In Paper and AZ Overland Blueprint are large enough to handle large quantity jobs, yet customer oriented and capable of moving quick and nimble to address individual concerns and deadlines in a hurry. As a nationwide provider of wide-format blueprint scanning services, our clients around the country enjoy how easy it is to do business with us. We make it seem as if we are “just around the corner!” We are constantly differentiating ourselves from our competition by providing the most hassle free service and staying focused on providing the most value to our customers at the lowest cost. We view our services as more than a commodity of scanning documents; we offer value in the form of solutions to our customers computerized digital document needs. We become a partner that wants to help with the most affordable solutions. AZ Overland Blueprint has 25 years’ experience in document management and with Scan In Paper are now one of the leading Scanning Service Bureaus. With clients ranging from government, to both public and private companies, we have vast experience in handling critical and sensitive material. We are confident that Scan In Paper and AZ Overland Blueprint can offer a solution to suit most any need. Scan In Paper and AZ Overland Blueprint’s Scanning service bureau offers a wide range of services including document scanning services, document conversion, large format document scanning, small format document scanning, construction architectural blueprint scanning services, on-site scanning, TIFF scanning, OCR scanning, and PDF scanning. For Color &/or an actual quote please contact us at (602) 224-9971 or email.